This entry was posted in Knitting and tagged art, craft, fan, feather, knit, knitting, lace, merino, passion, pattern, socks, toes, yarn. Last week I finished a sweet little lace shawl that I have been dying to show you all, and I decided that today is the day. You might remember a progress shot I shared with you a couple months ago of this shawl in the making, as it was my “airplane knit” that I started while going to Nevada and Arizona for a short vacation earlier this year, in April. What do you guys think? Isn’t this shawl pure lacy love? This pattern is called Estuary, from tincanknits, and it was knit using Confetti Superwash yarn by DGB. The pattern is entirely charted, very easy to understand and very easy to follow, the only change I made was to work the edge stitches in stockinette st instead of garter st. I simply LOVE the finished project! The yarn was something I found on sale at a local yarn store about a year ago, it was a yarn I had never heard of or worked with it before but I sort of liked the color, and since it was cheap I decided to try it. Although I didn’t hate this yarn, far from it actually, I don’t think I will use it again once I have used the remaining skein I have. Don’t get me wrong, this yarn was nice to work with, it has a nice soft feel and it definitely blocks very well, but it simply wasn’t a love story between it and me. I guess what it comes down to is that it’s a good yarn, but just not a “wow” yarn to me. Know what I mean? Anyways, I also got a pretty nice surprise a few weeks ago that I want to share with you – a new yarn store has just recently opened in my area, and I LOVE it! Yay for more yarn! This little store is cute and quaint, it’s friendly and cozy and it’s called Pompon Laine Café – if you’re in the Trois-Rivières area, you should definitely go check it out, it’s located at the intersection of Bonaventure and Saint-Denis. 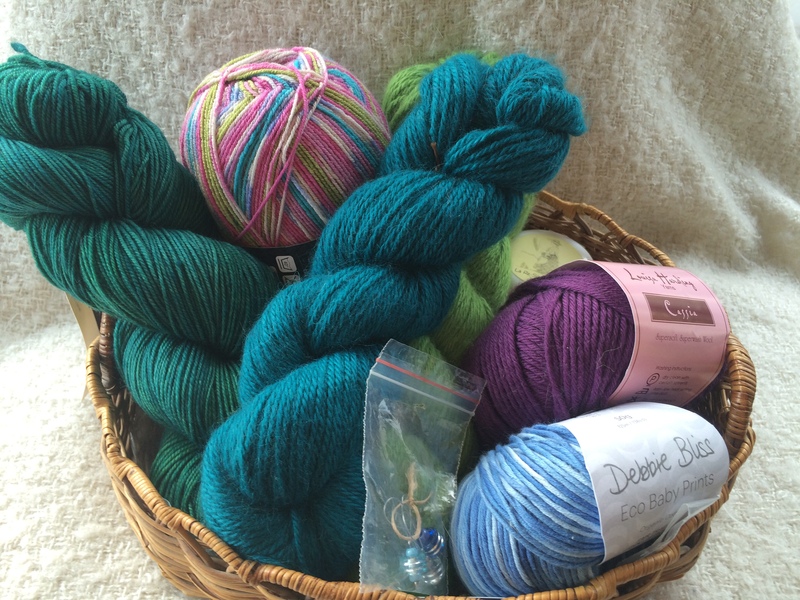 I went to the store opening a few weeks ago and got a membership card, and -oh, suprise!- I won a basket full of goodies including stitch markers, natural hand cream and (plenty) of yarn. Look at all these beautifuls! Am I not the most lucky knitter ever? This entry was posted in Knitting and tagged adventure, art, craft, crafts, fiber, knit, knitting, lace, passion, scarf, shawl, yarn.